The recent WW1 centenary has renewed interest for many people in visiting the WW1 battlefields to learn more about the war, to pay their respects or even visit the place where their ancestors may have fought for their country. These are some of the key sites you might like to visit on the Remembrance Trail on a self-drive WW1 tour. The Thiepval Memorial to the Missing of the Somme pays tribute to the 72,195 missing British and South African men who died in the Battles of the Somme and have no known grave. The memorial was built between 1928 and 1932 by the British Government and unveiled by the Prince of Wales with the President of France in 1931. A visitors’ centre was opened in 2004. The memorial is on the D73 next to the village of Thiepval. Entrance is free. Tel: +33 3 33 74 60 47. 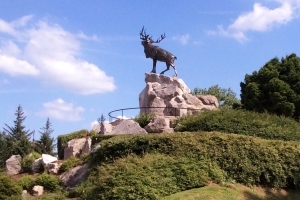 The fortress village of Beaumont Hamel was close to enemy lines during the war. It was the site of many battles including the unsuccessful attack on July 1 1916 which wiped out almost an entire regiment in half an hour. Today the 74-acre battle site is preserved as a memorial to those who died. The British Cemetery here has 97 identified and 82 unidentified burials, many of which were July 1st casualties. The headstones are all the same – no distinction is made for those of higher rank. In total, nearly 500 war casualties are commemorated on this site. Entrance is free. The Wellington Tunnels in Arras is will plunge you into the history of the Great War, the Battle of Arras and the tragic events that took place here. You will follow the story through the city and up to the Wellington Tunnels through the emotional discovery of the soldiers’ life before the assault. Then, enter the dark, dank tunnels which during the war housed Canteens, chapels, power stations, a light railway and a hospital and 25,000 thousand Allied soldiers. The relatively new ‘Ring of Remembrance’ beside the national military cemetery of Notre-Dame-de-Lorette at Ablain-Saint-Nazaire in the north of France – site of the three Battles of Artois – honours the 576,606 soldiers of 40 nationalities who died in World World One battles in the Nord-Pas-de-Calais area. Australian soldiers recaptured Villers-Bretonneux from the Germans on the night of April 24/25 1918. The Australian War Memorial at Villers-Bretonneux commemorates 10,774 Australian soldiers lost in France during the war, with their names engraved around the walls. Anzac Day is celebrated here every year on April 25. Entrance is free. La Caverne du Dragon (The Dragon’s Lair) was a 16th-century stone quarry which became an underground shelter and strategic military location from early 1915 onwards. Today its underground galleries, archived sound and image material and modern animation techniques allow visitors to understand more about the underground life of the soldiers based here. It is the most visited museum in the Aisne Department. Tel: +33 3 23 25 14 18. The Historial de la Grande Guerre (Museum of the Great War) was opened in 1992 and is a museum housing more than 70,000 everyday civil and military objects from the WW1 period. It is not a military museum but aims to show how the lives of everyone who lived through the war were changed. The modern Corbusier-style white concrete section is attached to the historic brick entrance through which visitors enter. It is set on the site of the Battle of the Somme in 1916 and the Battle of Picardy in 1918. Tel: +33 3 22 83 14 18.